How comfortable are braces? At the beginning of treatment, it will take a few days to get used to your braces. Teeth may have minor soreness from tooth movement. Even though braces are not rough, your mouth is very sensitive, much more sensitive than your hands. The braces may rub areas of your cheeks, lips and tongue. After a few days, you will become used to the braces, and they will be less bothersome. Getting used to the braces takes longer for adults than children. Using orthodontic wax will help you get over the initial period of adjustment. Will it hurt to have braces put on? No. Placement of braces is not painful. However, the cement that is used to attach braces to the teeth does not taste good. It is sour, about like bad orange juice. Once the braces have been placed, you can brush your teeth to get the bad taste out of your mouth. Will it hurt to have braces taken off? No. Will I have to wear a retainer? Once you have completed orthodontic treatment with a full set of braces, you will need to wear an upper and lower retainer full-time (all the time except eating, drinking and brushing) for at least a year. The purpose of the retainer is to hold the teeth in their new positions while the bone around the teeth stabilizes. Teeth have a “memory” that makes them want to move back toward their original positions. Retainers prevent this unwanted movement. Do teeth stay straight after orthodontic treatment? How straight teeth remain after orthodontic treatment depends on several factors. The type and severity of the original problems: People with more severe problems are more likely to see shifting of the teeth after treatment than people with mild problems. How well you wear your retainers: People who faithfully wear their retainers are less likely to have shifting of the teeth than people who do not faithfully wear their retainers. Not wearing retainers is a major cause of teeth shifting after orthodontic treatment. Growth of the jaws after treatment: Individuals who have disproportional growth of the jaws after treatment are more likely to see shifting of the teeth than individuals who do not have disproportional jaw growth. Disproportional jaw growth is when one jaw significantly outgrows the other. Most of the time this occurs when the lower jaw outgrows the upper jaw. Disproportional growth is frequently a hereditary problem, and it can be difficult to predict. Some shifting occurs in everyone; having orthodontic treatment does not guarantee that you will have perfectly straight teeth forever. Every individual, regardless of whether or not he/she has had orthodontic treatment, can expect some changes in the teeth with time as a result of normal aging. The amount of changes can be minimized by long-term wear of retainers and maintaining good periodontal health. Should I wear a mouth guard when playing sports? Absolutely. Wearing a mouth guard when playing contact sports, skateboarding or roller blading (with or without braces) is very important. Sports injuries, even at the junior-high level, can be serious enough to need extensive dental restorations and may also result in the loss of permanent teeth. During orthodontic treatment, Dr. Staggers will provide you with a mouth guard than can fit around your braces. Do not use mouth guards sold in drug stores with braces since these types can break your braces. I want an improvement in my smile, but I don’t want a full set of braces. Can orthodontics help? Sometimes minor problems can be corrected with a few braces or a removable appliance. However, major problems will require a full set of braces. At your consultation appointment, Dr. Staggers can tell you whether or not your teeth can be corrected without a full set of braces. Can braces stain the teeth? No. Braces do not harm the surfaces of the teeth. Poor oral hygiene during orthodontic treatment can stain the teeth. Plaque is a sticky material containing bacteria that builds up on everyone’s teeth. These bacteria produce an acid that decalcifies the tooth enamel (removes the calcium minerals). Decalcified enamel is initially white, but can become brown or black with time. Over time, tooth decalcification (less mineralized enamel) can become a cavity. Brushing and flossing removes plaque from the teeth and can prevent tooth decalcification. 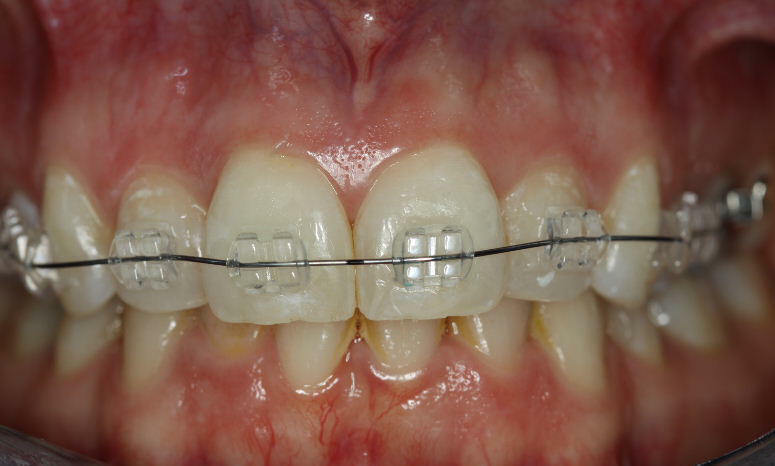 Proper brushing and flossing during orthodontic treatment is essential. Fluoride rinses can also help prevent tooth decalcification. Modern orthodontic cements that are used to attach braces to the teeth also release fluoride over time to help prevent tooth decalcification. Can braces cause gum disease? No. Braces do not harm the gum tissue. Poor oral hygiene during orthodontic treatment can cause gum disease. Plaque is a sticky material containing bacteria that builds up on everyone’s teeth. These bacteria produce an acid that can eat away at the gum tissue and the underlying bone support for the teeth. Gingivitis is the first stage of gum disease, and it is characterized by enlarged gum tissue and bleeding gums. BLEEDING GUMS IS A SIGN OF UNHEALTHY GUM TISSUE. Receding gum tissue is a more advanced sign of gum disease. Proper brushing and flossing during orthodontic treatment, as well as fluoride rinses, can prevent gum disease. Click here to see proper brushing and flossing techniques. Hit escape to exit slide show. Can I chew sugarless gum during treatment? NO GUM OF ANY KIND should be chewed during treatment. Gum can break the braces. What types of foods should I avoid during orthodontic treatment? Hard and sticky candy should be avoided, like Jolly Ranchers, fire balls, jaw breakers, Skittles, Tootsie Rolls, Nerds, Runts, gummy candy, licorice, hard mints, Life Savers, caramel, nuts, ice and popcorn. Apples and raw carrots should be cut up into pieces. Do not eat corn on the cob or very hard crusty bread. Are there different types of braces? Yes. The most common type of braces are made of stainless steel. Gold braces are also available and are made of gold-plated stainless steel. Porcelain braces are sometimes referred to as “clear braces.” Porcelain braces are made of a glass-like material, but they are not perfectly clear. They are pale white in color. Sapphire braces are similar to porcelain braces, and they are perfectly clear.